This week, House Speaker John Boehner agreed to tie funding of the government to defunding Obamacare, as conservative members of his caucus have demanded. This proposal may be unlikely to survive the Democratic-controlled Senate, not to mention the president’s veto pen, but recent Pew Research Center surveys show that it is clearly in step with the attitudes of the GOP primary-voting base. Most GOP primary voters not only oppose the Affordable Care Act, but they want elected officials who oppose it to take action to make it fail. Overall, the latest Pew Research Center/USA TODAY survey found Republicans and Republican-leaning independents divided over how to handle Obamacare: while 85% oppose the law, 37% say lawmakers should try to make it work as well as possible, while 43% say lawmakers should try to make it fail. But among Republicans and Republican-leaning registered voters who say they always vote in primary elections, a 53% majority says they want elected officials to do what they can to make the health care law fail, compared with just 32% who say they should try to make it work as well as it can. By contrast, just 38% of Republican voters who say don’t always vote in primaries want lawmakers to work to undermine the Affordable Care Act, and just 33% of Republicans who are not registered to vote take this view. Republican primary voters have been more dissatisfied than not with their party’s leadership and they are in no mood for compromise. By a 65%-32% margin, more Republican primary voters disapprove than approve of the performance of GOP congressional leaders. And when it comes to working with congressional Democrats, nearly twice as many Republican primary voters say Republicans in Congress have compromised too much with Democrats (42%) rather than not enough (22%). 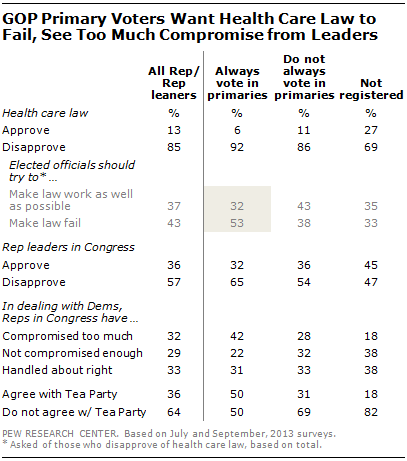 Republican and Republican-leaning voters who do not always vote in primaries take a more moderate stance: 28% say GOP congressional leaders have compromised too much, 32% say not enough. Our data show that half of Republicans (50%) who always vote in primary elections say they agree with the Tea Party movement. This compares with 31% of Republican voters who do not always cast a ballot in primaries.